What kind of trip does someone who works in the travel industry take? 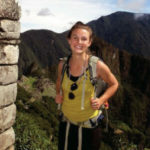 Meet Lisa, the Media Manager at Knowmad Adventures – a South American travel company that crafts active, authentic and sustainable experiences for the independent traveler. Follow her two-week itinerary in Chile through the photo essay, “9 Things To Do in Chile.” Lisa and her travel companion Cole visited the Atacama Desert, the capital city, the Lakes District and the two ended their trip near the end of the world in Torres del Paine National Park, Patagonia. 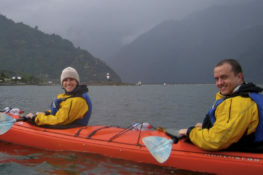 Read about Lisa and Cole’s adventurous Chile trip below. It’s challenging to share your memories and experiences with others, especially online. Evoking the same feeling that you experienced on your trip, in another, through a few photos is near impossible. With the pictures of Chile I share below I hope to inspire a sense of wonder. I hope to inspire the feeling you get when you see a new place or taste a new flavor and all of those other emotions you can’t exactly put your finger on! And aside from all of that, I want to preface my “9 Things To Do in Chile” photo essay with a few notes: This two-week trip to Chile was one of the most incredible experiences of my life. Every night I couldn’t stop smiling and every morning I couldn’t wait to wake up. This truly was the adventure of a lifetime! Driving from the airport in the city of Calama to San Pedro de Atacama you begin to wonder if anything can live in such a dry, extreme environment. As we pass through Patience Valley, a long stretch of road that looks deceivingly short right before you enter the town of San Pedro de Atacama, the landscape begins to change a bit. We’re greeted with vegetation, farming and plants. Later, we learned that the San Pedro de Atacama River that runs through the pueblo (although it’s almost completely dry) is partitioned into irrigation channels where it supports agriculture in the area. One of our favorite memories was our first dinner at the Awasi Atacama Relais & Châteux luxury lodge. Cole and I were incredibly impressed with the food and the entire team was extremely knowledgeable and friendly. During dessert we commented to Aldo, our waiter, that what we were tasting was unreal, an amazing flavor we had never experienced before. Without hesitation, he walked over to a tree only 10 feet from our table and plucked off a few pea pods. He then explained to us that we were tasting the inside of the pea pod found on an Algarrobo tree (pictured above) and then in front of us he simply split open the pea pod and passed it around for a taste. This ingredient is commonly used in foods in the Atacama Desert and is also consumed by local llamas and foxes. It was fascinating to see such a meticulous, beautiful dish in front of us while at the same time tasting one of the ingredients straight from the source. A photo of Cole’s lunch on our last day at Awasi Atacama. Tasting llama meat on our way back from the Tatio Geyser! The Aguas Calientes Salt Flat hike was a definite highlight for Cole and me. Our guide Manfred, from Alto Atacama luxury lodge, was a warm and friendly person that shared an immense amount of regional history with us. One of the reasons we enjoyed this hike so much is that we truly felt we were off the beaten path. It was a two hour drive just to reach the “trailhead” – which wasn’t really a trailhead at all but the start to a path forged by vicuñas and hikers that we never would have identified on our own. This excursion was not a highlight just because of the incredible, expansive views and remote location but also because the hike was above 13,000 feet the entire time. Pun intended, it truly took our breathe away! Before our Incan bath we took a tour of the Alto Atacama property with Veronica, the lodge’s landscape architect. We learned about their sustainability efforts, the design of the outdoor spaces and the vegetable gardens (they even grow alfalfa on the property for the llamas). Our garden tour ended at the far edge of the property where a string of soaking tubs overlooked a phenomenal view of the San Pedro de Atacama riverbed. We were greeted with fresh juice and snacks and left to enjoy the warm Incan bath. The term Incan bath comes from the way the water is extracted from the ground, in this case it’s taken from far below and run through a pipe – where it warms – all the way into the bath. Mercado Central in Santiago is a fish market that has shifted to cater more towards travelers rather than locals, but is a beautiful market to see none the less. Above are a few photos from La Vega market in Santiago. We visited the market on a Sunday and this place was bustling! La Vega is known for their produce and many people who live in the area come here for their weekly shopping, including our culinary guide, Connie. We learned how to make five different Chilean recipes in our cooking class. We started out by learning how to make a Pisco Sour and Connie shared with us her recipe for a special, infused ‘simple syrup’ that she makes – it was so good! Then we made pebre, which is similar to pico del gallo, that we enjoyed with sopapillas. Next, Connie taught us how to make and plate the ceviche you see above. What I particularly liked about this ceviche is that it was made with mushrooms instead of raw fish, which gives you a similar texture and taste but made the dish more appealing to those who may not like raw fish. The ceviche was topped with watercress and a fried plantain to give it a little crunch. We also made traditional empañadas and a delicious poached pear dish for dessert. Fly fishing the Liucura River was another big highlight for me and Cole. We currently live in Bend, Oregon where we fly fish together quite a bit and we were excited to test our luck in a different country. This particular trip I took more photos than casts but Cole did catch a few trout and at the end of the day he fought a massive chinook salmon for about 30 minutes! Unfortunately, after a very tiring fight, the fish swam under a log and broke off. We were all a little bummed walking back to the car after “the one that got away” but we quickly remembered what a fantastic day on the river it really was – cold beers, a few great fishing holes and great weather, what more could you ask for? We started our morning out kayaking in a glassy lake near the base of the San Sebastián hike. Above are a few photos taken on a shortened version of the San Sebestián hike we did outside of Pucón with our guide Felipe. We were lucky enough to have Felipe as our guide for a few of our excursions and by the end we felt we had truly made a friend in Pucón. On the hike pictured above, Felipe explained to us that the “monkey puzzle tree” is famous in the area because it only grows 3 centimeters a year and can live to be over 3,000 years old. The tree can withstand many types of extreme weather and can even live through forest fires. A few photos from our garden and Hotel Vira Vira property tour with Luis. A true farm-to-table experience. The inside of the on-site creamery. This part of the tour was extremely fascinating, it’s amazing how much time and precision goes into making cheese. Photos of the dining experience at Hotel Vira Vira. We were beyond impressed. This hotel knows how it’s done. Everything from their service to their interior design to the taste of their food was on point. If anyone has ever told you they can’t taste the difference of farm-to-table, fresh food – I beg to differ. This was simply the best and the freshest food I have ever experienced. On our first ride we visited our gaucho’s cabin in Torres del Paine where we shared mate and chatted about how they managed living in such a remote area. Horseback riding in Patagonia was one of the activities I was most excited for before our trip to Chile. We were able to do three different rides in Patagonia and it continues to be one of my favorite ways to experience a new place. We were lucky enough to be able to ride with Explora, a Patagonia luxury lodge that is well-known for their top-notch horseback riding excursions. One of my favorite memories was coming up on a group of gaunaco and following the gaucho as we cantered and navigated through the running herd. The hike pictured above was full of picture worthy view points. I’m still not sure what was considered “the summit” because the entire hike was so beautiful. We stayed at Explora Salto Chico Lodge in Patagonia which is renowned for its excursion quality and access to terrain in Torres del Paine National Park. This lodge was a perfect fit for us because we wanted our experience in Patagonia to be excursion focused. If you’re interested in a more design-focused lodge or perhaps a more private experience then Tierra Patagonia or Awasi Patagonia might be a better choice. See here for a thorough Patagonia lodge comparison. This entire trip was a “wow” moment. 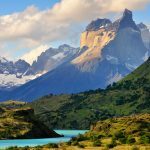 It is hard to capture the essence of such an amazing trip with just this article “9 Things To Do in Chile,” but these were the highlights that stood out to me. The people and the excursions above made our experience the trip of a lifetime rather than just a trip. I’ll be sharing more about my adventure in the months to come, but if you really want to experience Chile you’ve just got to get down there yourself! If you’re interested in crafting a custom and private trip that encompasses these highlights in Chile and more, contact a Knowmad Trip Specialist at 612-315-2894 or email travel@knowmadadventures.com today.